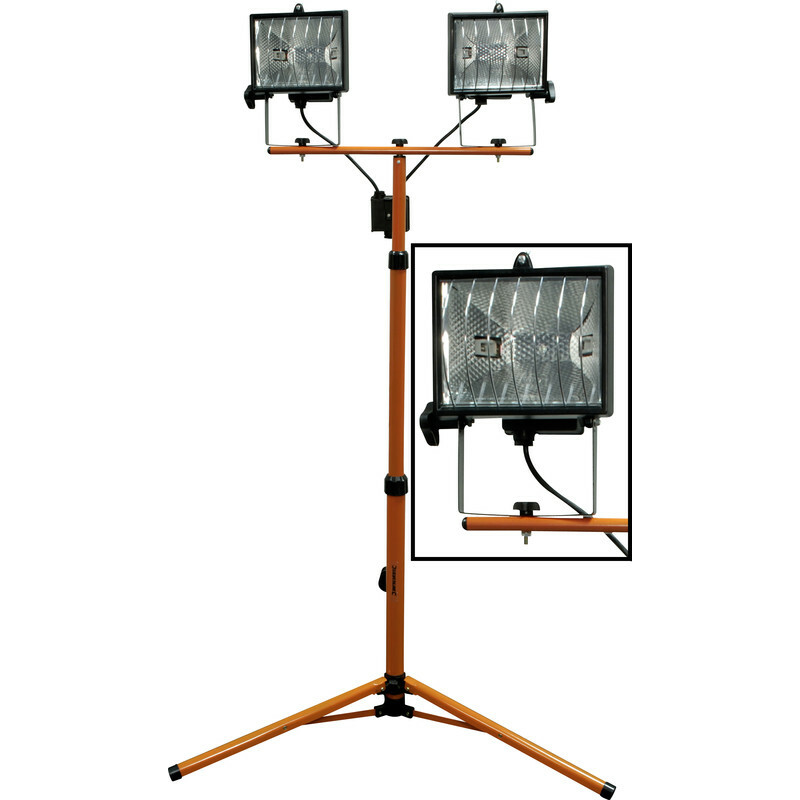 2x 400W halogen floodlights attached to an adjustable stand (1.3 - 1.7m). Includes 2x 400W lamps. Re-order 71276 for 110V and 89899 for 230V. Comes with 2.4m of cable. This luminaire is compatible with bulbs of the energy classes A to E and is sold with a bulb of the energy class D.
Tripod Site Light Double 1000W 110V is rated 4.6 out of 5 by 37. Rated 1 out of 5 by Sbromley1 from Cheap screws so couldn’t access the bulbs Bought this item today to do a paint job in a room with no lights. Set it up fine but when it came to fitting the bulbs (that come with it) I couldn’t open up the lamp heads, this was because the screws just wouldn’t budge. They are so cheap that any screwdriver just chewed up the screw! This made the lights completely unusable! Didn’t even get as far as plugging it in and had to return. I’m sure if I could have got as far as switching on this item would have been ok, but let me down at a time I really needed it! Rated 4 out of 5 by Alfiebo from Works well Needed this to do painting in the evening. Works very well but does give off a lot of heat. Rated 5 out of 5 by Dunerunner from night and day as a professional painter and decorator i have used work lights for years. The new LED lights are cheaper to run, do not get hot and thats about it, put one of these on and the difference is obvious , night and day. but maybe some decorators cant deal with this brightness, they show up every defect, so if you want the best possible finish use these !